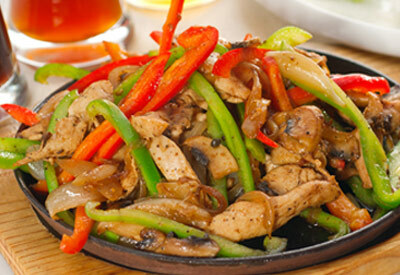 Marinate chicken breast strips in fajita marinade for approximately 30 minutes. In a skillet, cook mixture over medium-high heat for 5 to 6 minutes (or until chicken is no longer pink). Stir in vegetables and continue cooking approximately 5 to 6 minutes (stirring occasionally), until vegetables are cooked, hot and crisply tender. Serve in warm tortillas, topped with salsa, cheddar cheese and/or sour cream.